Corrie is a young war widow at loose ends. Her husband died a hero in Iraq, saving others at the cost of his own life. Corrie’s society-minded mother thinks she should get on with her life, but that’s easier said than done, so Corrie heads to husband Jarrod’s home deep in the Missouri Ozarks, to the house they planned to restore together. 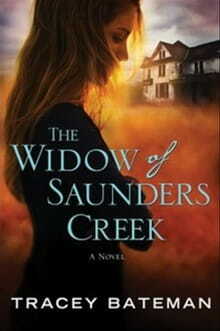 It’s the one place she feels closest to her dead husband; maybe living there will help keep his memory alive. But once she moves in, Corrie finds that Jarrod might actually feel a little too close; his memory might not be the only thing alive in that house. She wonders: is that a bad thing? Corrie herself is caught in the middle. On the one hand, she’s not ready to let go of her beloved husband and if she can keep their love alive, maybe it’s worth a little spookiness. On the other hand, it doesn’t feel right, and she was brought up in church, so maybe Eli has a point. In a day when ghost hunters and psychics are all the rage on cable television, it’s nice to read a book that deals with spiritual oppression from a biblical perspective. For a novel of this type, The Widow of Saunders Creek is refreshingly normal. We don’t see anything from a demonic or angelic point of view, there’s no hype or hysteria; we watch the events unfold with appropriate respect for their power, but with even more respect accorded to the power of God. It’s not all demon hunting, either. More than one romance is woven through the story. Bateman does a fine job creating a setting that’s just creepy enough and populating it with characters who are well-rounded and real. Eli is more than a contractor; he’s a pastor with a few unresolved issues regarding his deceased cousin—and a few more issues with his attraction to Jarrod’s widow. He shares narration duties with Corrie, who walks through her grief honestly, with a determination that will have readers rooting for her. Meanwhile, Jarrod’s Aunt Trudy (one of the mystically-oriented family members) is convinced that her psychic ability is a gift from God and her occult activities are a calling much like Eli’s calling to the ministry. It’s an ‘interesting’ perspective, but rest assured this story comes down firmly on the side of the angels—even if we don’t see any.